Fold up the rear cover in the variable luggage compartment floor and secure it on the right using the support rod. Unscrew the handwheel in the middle of the spare wheel anti-clockwise fully and remove the spare wheel. Place the removed wheel into the spare wheel well with the rim facing downwards with the central hole in the rim positioned exactly above the stud. Turn the handwheel clockwise on the stud until the wheel is secured firmly. If necessary, place the vehicle tools back in the container in the luggage compartment. Remove the support rod and fold the cover back onto the luggage compartment floor. 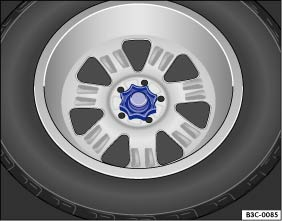 If the spare tyre is not the same as the tyres that are mounted on the car - for example with winter tyres - only use the spare tyre for a short period of time and drive with extra care . Refit the normal road wheel as soon as possible. Do not drive faster than 80 km/h (50 mph)! Avoid full acceleration, sudden braking and fast driving through bends in the road! Do not use snow chains on the temporary spare wheel . The tyre pressure must be checked as soon as possible after the spare wheel or temporary spare wheel has been fitted . The tyre pressure of the spare wheel or temporary spare wheel should be checked together with the normal tyres, at least once a month. The spare tyre should have the highest pressure allowed for the vehicle . The tyre pressure for the temporary spare wheel can be found on the sticker on the temporary spare wheel. Incorrect use of the spare wheel or temporary spare wheel can lead to a loss of control over the vehicle, to collisions or other accidents and cause serious injuries. Never use a spare tyre or temporary spare tyre if it is damaged or worn down to the tread wear indicators. In some vehicles, the spare wheel could be smaller than the standard wheel. The small spare wheel has a sticker with the text 80 km/h or 50 mph. This is the maximum speed you are permitted to drive with this tyre. Never drive faster than 80 km/h (50 mph). Do not accelerate quickly, brake suddenly or drive at high speed through bends. Never drive further than 200 km with a 16'' temporary spare wheel if it is fitted to a drive axle. The temporary spare wheel should be exchanged for a normal wheel as soon as possible. The temporary spare wheel is designed for a short period of use only. The temporary spare wheel must always be secured firmly with the wheel bolts supplied by the factory. Never use more than one temporary spare wheel. After fitting the temporary spare wheel, the tyre pressure must be checked as soon as possible . Snow chains cannot be used on the temporary spare wheel. If possible, stow the spare wheel, temporary spare wheel or the removed wheel safely in the luggage compartment. In vehicles with a breakdown set, the removed wheel cannot be secured.